Chile secured a Confederations Cup semifinal spot after drawing 1-1 with Australia in Moscow to claim second spot in Group B, but were made to work hard for their victory in the face of a strong Socceroos’ performance. Chile knew going into the game that a draw would be good enough to guarantee a semifinal spot and they could even have progressed with a 1-0 defeat due to their superior goal difference. 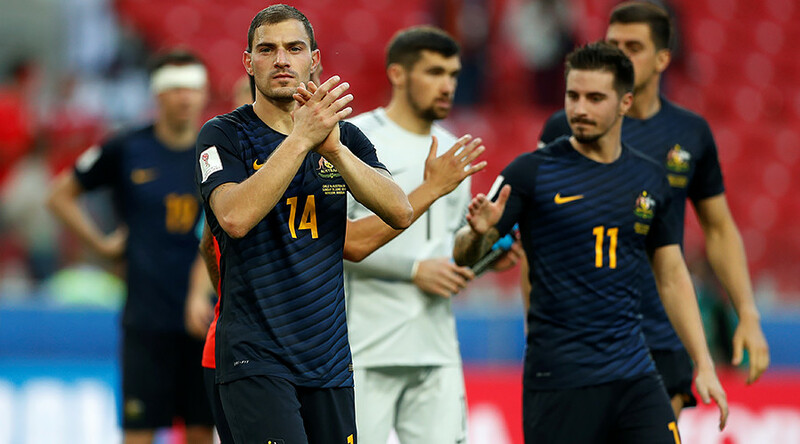 In the end they scraped through with a draw after coming from behind against an inspired Australia team, with Martin Rodriquez’s second-half strike canceling out James Troisi’s first-half opener for Australia. With Germany defeating Cameroon 3-1 in Sochi to top the group, Chile finish second on five points, and face a Wednesday semifinal in Kazan against Cristiano Ronaldo’s Portugal, who were Group A winners. Chile boss Juan Antonio Pizzi made changes going into the game against Australia, with captain Claudio Bravo recovering from injury to play in goal for the first time at the tournament. For the Aussies, head coach Ange Postecoglou made six changes from the team that drew with Cameroon in the week, with Tim Cahill, 37, coming into the team to win his 100th cap - becoming only the second Australian player ever to reach the milestone. Amid a fast start to the game, Maty Ryan saved well from Chile striker Eduardo Vargas on 12 minutes. The Socceroos pressed hard throughout the opening stages, not allowing Chile space and hassling them into mistakes. Chile thought they had a chance for a penalty when Alexis Sanchez went down in the box on 26 minutes, but the video replay showed that Aussie captain Mark Milligan timed his tackle perfectly. Some big tackles flying in saw the Socceroos pick up four yellow cards in first half, including centurion Cahill – which was indicative of their full-on approach in making life uncomfortable for Chile in front of over 33,000 fans at Spartak Stadium. The Australians were rewarded for their bright stat when they took the lead on 42 minutes, when the ball fell to James Troisi on the left of the box and he scored with a lovely dinked finish over on-rushing Chile ‘keeper Bravo. Chile were still heading through to the semifinals as the Socceroos needed to win by a two-goal margin to overhaul the South Americans’ superior goal difference, but it was no doubt an uncomfortable team talk for Pizzi at half-time. Both teams started brightly after the break, but Australia saw their lead cancelled out when Martin Rodriquez equalized for Chile by poking the ball home on 67 minutes. Australia continued to hassle and harry, and had a good chance on 72 minutes when Troisi played a lovely through-ball to Jamie Maclaren, but the striker couldn’t guide his effort goalwards. Australia boss Postecoglou made several changes as his team went in search of the win, but Chile closed the game out for the draw they needed. The Australians will claim huge plaudits for their performance and can feel they were unlucky not to have pulled off a major shock. They exit the tournament in third place in Group B.
Chile roll on to the semifinals, knowing they survived a battle here but will be nonetheless be confident ahead of the clash against Portugal.